All Fisher Bull Sleds are fully expandable. 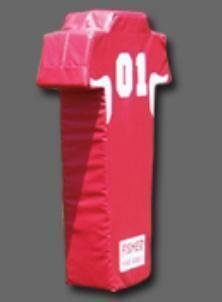 Within minutes a seven man sled can become a 2 man and a 5 man sled for more effective practices. 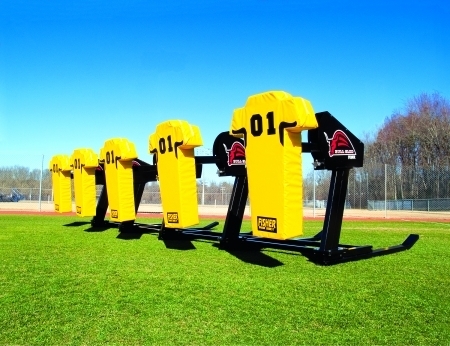 You can start out with a 2 man sled and add blocking stations whenever you want to expand your program. • Buy a 2 man now and add additional stations later. Main Frame: Tough, durable and guaranteed for five years. Full 5 year warranty on metal parts. All metal surfaces are powder coated to prevent rust. Sled skids are formed, not cut and welded. 30 degree angles assure a smooth transistion over your grass or turf.